Water in My Basement: What Do I Do? Use hydraulic cement to stop active leaks in the basement. 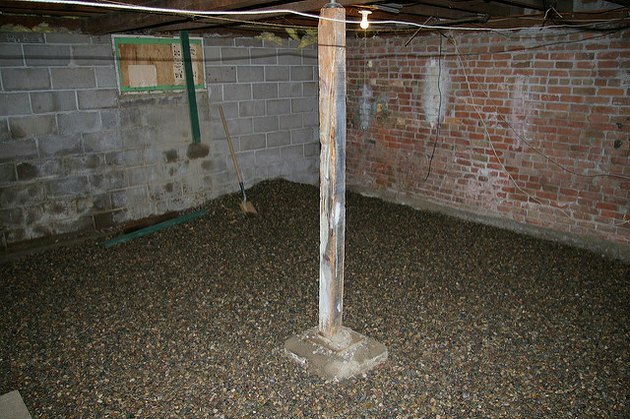 By their very nature, basements are more prone to moisture than other areas of the house. They are below grade, so hydrostatic pressure can push groundwater through any porous surface or small fissure in the walls or floor. Moreover, basements are usually poorly ventilated, which makes them vulnerable to humidity and condensation. A damp basement is usually a moldy one, and when things get really bad, water can even pool on the floor and provide a breeding ground for pathogens. When moisture becomes a problem, it's important to determine whether the water is coming from outside or inside, because the remediation strategies are different. When water is coming from outside, the best strategy is usually to improve drainage around the exterior of the house, although you may be able to block seepage to a degree by making indoor repairs, such as patching cracks and plugging holes. If condensation is the culprit, you'll probably want to improve ventilation and add insulation to the walls to reduce the temperature differential that causes condensation to form. In extreme situations in which water actually pools on the floor, you may need to control it with a pump. 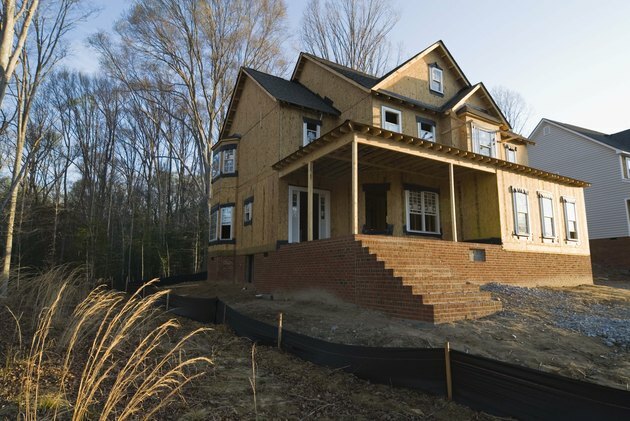 The ideal location for a house with a basement is on a small rise. Extend the gutter downspouts. This is the easiest solution, and it is often remarkably effective. If the downspouts are pointing straight down, all the roof runoff water has nowhere to go except into the ground near the foundation. It won't cost more than $100 to purchase downspout extensions to direct the water away. Build a berm. If runoff comes from higher ground, you may be able to divert it away from the house by building up the ground around the foundation. This is another relatively inexpensive solution, because all you need is to truck in some clay-like soil and pack it against the house. You may not even need to place it around the entire foundation—just around the places most vulnerable to runoff. Construct a drainage system. A high water table or placement of the building in a low-lying depression may call for a drainage system. This is a job for a drainage expert, and it may cost several thousand dollars. Essentially, the solution involves digging a trench around the foundation and installing a French drain system that channels water to a point where it can flow away from the house. This is the best way to go if you get seepage or flooding in the basement because of a high water table or frequent heavy rains. Likely places for seepage and efflorescence include around pipes and window casements. Hydrostatic pressure forces water through cracks and holes in concrete walls, and as long as water is confined to these damaged areas, you can usually stop it by patching with hydraulic cement. This mortar-like product sets quickly and can withstand such high pressures that it's even recommended for patching concrete water tanks. Spread it around pipes that pass through walls, around window casements that are leaking and in any cracks in which you see moisture or _efflorescence—_salt deposits left by seeping water. Before using hydraulic cement to fill a crack, use a cold chisel to widen the crack and create a V-shaped groove to give the cement a good bonding surface. Waterproofing coatings can be useful in controlling moisture to a degree, but you can only apply them to bare, dry concrete and brick. Before applying a waterproofing product, remove all efflorescence by scrubbing with a vinegar/water solution to ensure adhesion. Vinegar is an acid that can dissolve the mineral salts present in efflorescence, and it's safe to use. 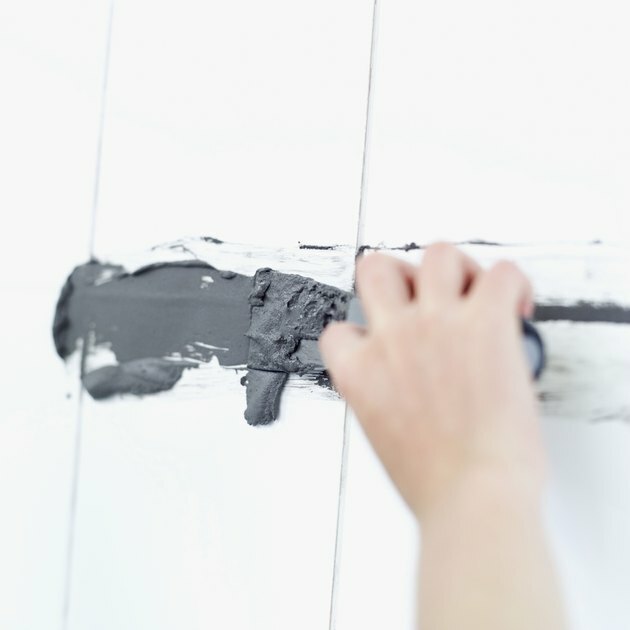 Once the efflorescence is gone and the wall is dry, apply the coating with a brush or a sprayer, being sure it forms a continuous coating with no voids. You usually have to apply two coats to ensure this type of coverage. 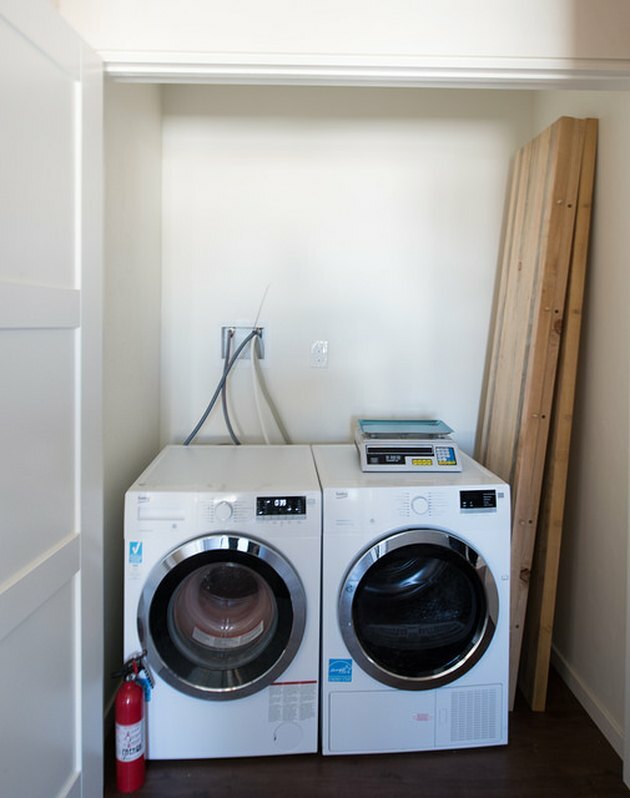 A clothes dryer in the basement can be a source of humidity. Basement humidity may, in part, be due to seepage through the walls, but it can also come from inside the house. For example, when the laundry room is in the basement, the dryer often drives up humidity. Pipe leaks also contribute. Basement air is often stagnant, so the moisture in the air has nowhere to go and it settles out as condensation on the walls, floor, furniture, and carpeting, creating ideal conditions for mold to grow. Waterproofing paint or vapor barriers won't do anything to solve this problem. If possible, you should try to increase ventilation, but that isn't always possible. Another solution is to insulate the walls with layers of rigid foam. Turn your unfinished basement into a finished one by securing rigid foam insulation to the walls with 2 x 2 battens, then hanging drywall on the battens. This helps reduce the temperature differential that causes condensation to form. 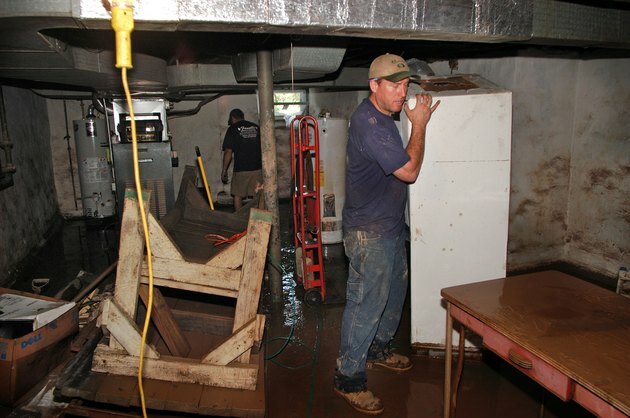 A sump pump helps control flooding in the basement. Water doesn't always enter the basement through the walls. Sometimes it comes in through a floor drain connected to a drainage system that backs up during heavy rains, or it can seep in through the floor. This can happen if the water table is high or if drainage issues causing water to collect under the house. If efforts to prevent this through drainage improvements fail, you may have to install a sump pump system to keep the basement dry. The sump pump typically goes into a pit dug into through the concrete and into the ground underneath the house. It may be connected to a drain tile system that runs beneath the perimeter of the basement slab to channel water to the sump pit. Groundwater often flows like a stream through the soil, and the sump pump controls it by diverting the water through a hose up and out to a runoff location somewhere outside the home. A sump pump system consumes energy, and it isn't always quiet, so it's a last resort when all other efforts to control water fail. A sump pump and drain tile system can cost several thousand dollars to install as a retrofit, but where basement water is an ongoing problem, it can turn a problem basement into reliably dry living space.